A powerful broadcasting platform to beam television, data and air-traffic navigation signals across North America arrived in orbit today, capping a 9-hour ascent atop a Russian-made rocket. The Canadian Anik F1R satellite began its 15-year space mission at 2153:40 GMT (5:53:40 p.m. EDT) Thursday when it launched from the Baikonur Cosmodrome in Kazakhstan. Over the next 10 minutes, the commercial Proton M rocket's lower three stages completed their programmed firings to heave the 9,900-pound spacecraft skyward from the remote launch site in Central Asia. Then the Breeze M upper stage assumed control, conducting an initial engine firing to reach a preliminary orbit around Earth. Four more burns strategically timed during the next nine hours methodically raised the altitude into a looping orbit stretching 22,300 miles at its farthest distance from the planet, 2,000 miles at the closest and inclined 10 degrees from the equator. The rocket's mission -- managed by International Launch Services -- was hailed as a success when the payload was safely released from the upper stage. Anik F1R's onboard propulsion system will complete the task of circularizing the altitude to geostationary orbit 22,300 miles above the equator where the craft will be parked at 107.3 degrees West longitude over the eastern Pacific Ocean. Canadian satellite operator Telesat, a firm created in 1969 and distinguished by launching the world's first commercial domestic communications satellite into geostationary orbit in 1972, plans to press Anik F1R into service this fall. The new spacecraft is the "latest in a long line of Telesat satellites to pioneer critical services that benefit millions of people across North America every day," said Larry Boisvert, Telesat's president and CEO. It features 32 Ku-band and 24 C-band transponders for television transmission and data relay services, forming a telecommunications network for use by broadcasters, businesses and governments throughout North America. In addition, a navigation package operating in C-band for uplink and L-band for downlink will provide precision Global Positioning System-based guidance information to aircraft at thousands of airports and landing strips that lack such a capability today, Telesat says. The craft was built in Europe by EADS Astrium and is based on that company's E3000 design in the Eurostar family of satellites. Anik F1R replaces the five-year-old Anik F1 spacecraft, which is stricken with a solar array design flaw that has shortened its service life. 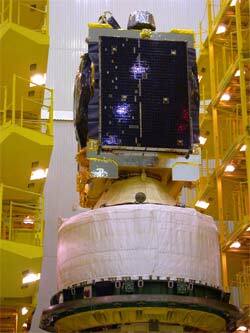 This launch was the third ILS Proton mission of 2005. The joint U.S./Russian venture, formed 10 years ago to sell Proton and American Atlas rockets, has completed six launches this year between its two vehicle fleets. All have been successful. "With today's launch, the Proton Breeze M continues its 100 percent successful mission record," said ILS President Mark Albrecht. "We're glad to again provide a good launch for Telesat, which had the confidence in ILS to be the first commercial customer for this configuration nearly three years ago." 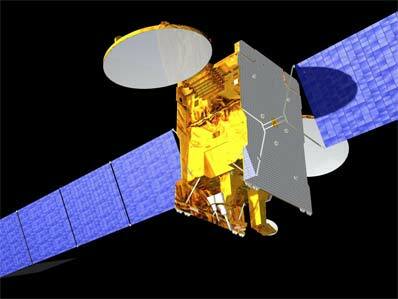 "Telesat's success would not be possible without partners such as ILS. 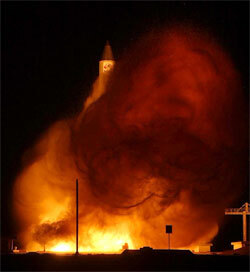 After all, reliable satellite communications begin with a reliable satellite launch," said Boisvert. The key players in today's launch -- ILS Proton, EADS Astrium and Telesat -- will team up again next year to launch the Anik F3 spacecraft.